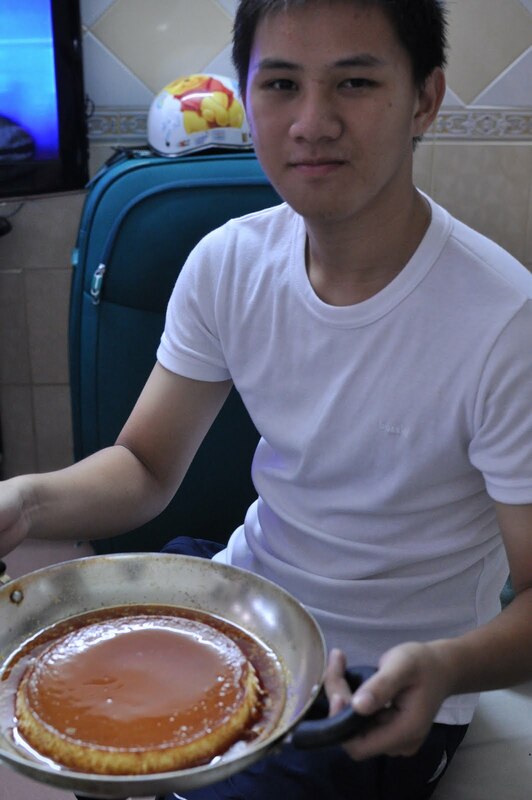 This time, he showed me how he makes creme caramel because he is setting up a little street stall outside the house. In a parallel universe, I happened to be playing around with creme caramel in London for the supper club at the same time he started to experiment with recipes. We both had a strong miss and craving for the creme caramel you can get in both our mother’s home town of Phan Thiet – 5 hours away from Saigon. For the caramel, I use coffee instead of water for a difference. It makes it taste subtly of coffee as it is only at the base in the caramel which is great for evening desserts as you shouldn’t really drink coffee so late. I have experimented with many variations and found this combination to be rather good. You will need 20 – 24 remekins or 2 large oven proof dishes. You can also use any oven proof dish in different sizes to contain the custard so long as its about an inch in depth. -Once the caramel is ready, pour a thin layer onto the remekins quickly, making sure all the surface is covered at the bottom and along the sides. Leave to set hard. If it doesn’t set, then you should take it out with a spatula and reheat the caramel. Normally, you can see when its ready as the sugar turns brown, but when you use coffee, its brown from the start. -Bake for 20 – 25 mins.